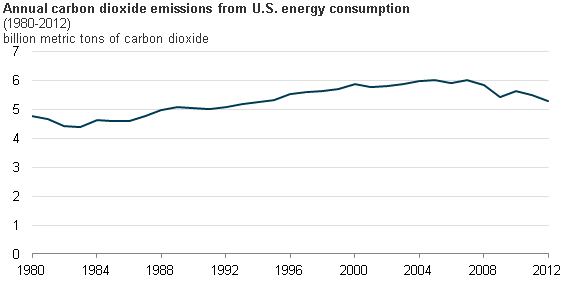 Some good news on U.S. carbon emissions: They fell again last year. Carbon dioxide emissions from the combustion of fossil fuels used for transportation, power, industry and in our homes fell 3.4 percent in 2012, according to a report from the Energy Information Administration (EIA). In fact, they’ve fallen 12 percent since their 2007 peak, to the lowest level since 1994. Why were carbon emissions down last year? The short answer is because we used less coal and petroleum, the most carbon-intensive fossil fuels. But there are various reasons for that decline in use. One is the weather. An unseasonably mild winter meant less fuel was burned to heat homes and offices. A bigger factor, however, is that we’re using less coal as power plants switch to cheaper natural gas. New drilling technologies developed with help from the federal government, have led to an abundance of natural gas, the least carbon-intensive fossil fuel. The natural gas boom of late 2011 and early 2012 led to a 10-year low in natural gas prices. This fundamentally altered the economics for electric power generation. Suddenly, it was cheaper to run natural gas power plants than coal power plants. In April 2012, net generation from natural gas power plants (32 percent) almost equaled coal-fired generation (33 percent). Since natural gas combustion emits about half as much carbon dioxide as coal combustion, substituting natural gas for coal in the power sector is a major contributor to declining emissions. We’re using less petroleum for several reasons. First, we’re driving less. In recent years, driver behavior appears to be changing, perhaps as a result of higher gasoline prices, with fewer vehicle miles traveled per year. Second, we’re getting better gas mileage when we do hit the road. Government regulations are requiring improved vehicle efficiency. As the average efficiency for the entire vehicle fleet improves, fewer gallons of gasoline are needed to make the same trips. Unfortunately, it’s not all good news. As some natural gas producers cut back due to low prices, the price of natural gas began to creep up in late 2012. Natural gas-fired power generation became less economic in many locations and coal generation increased. In its Short-Term Energy Outlook, the EIA predicts that as natural gas prices increase over the next couple of years, the market share for natural gas will slip from 30 percent last year to 28 percent. As a result, carbon dioxide emissions from the power sector will likely go up. That means that market forces, which have helped lower carbon emissions, could drive a return to coal. In order to preserve and accelerate the downward trend in carbon dioxide emissions, policy is needed to encourage lower and zero-emission energy sources and to encourage energy efficiency to reduce demand. Since fossil fuels, whether natural gas or coal, will continue to comprise more than 60 percent of power generation well into the future, it also makes sense to continue to support government and industry work toward commercialization of carbon capture and storage technologies.